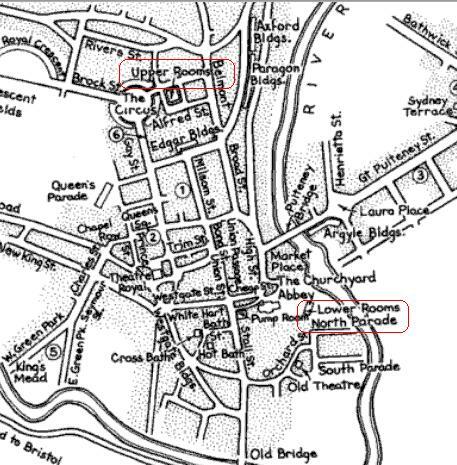 The lower rooms, built in 1708, were Located on Terrace Walk near beautiful South Parade off the banks of the Avon River. 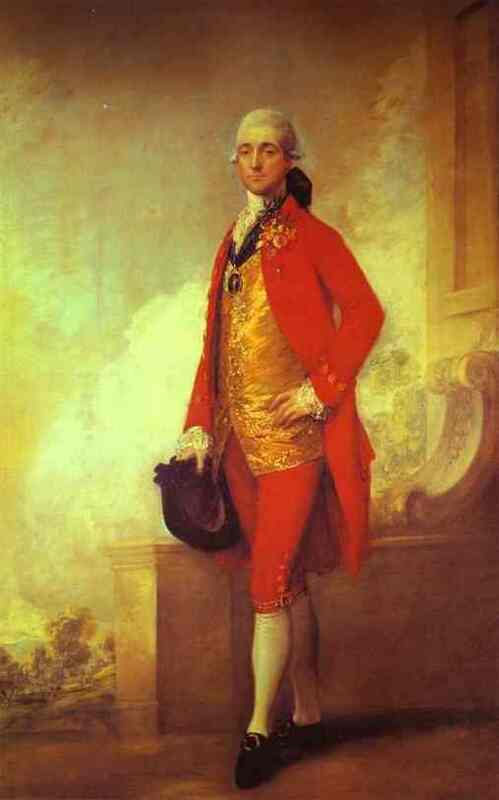 James King, the Master of Ceremonies who introduced Henry Tilney to Catherine Morland, was an historic figure who actually performed as Master of Ceremonies in the lower rooms from 1785 to 1805. He then became M.C. of the upper rooms, which had recently been built in the newer more fashionable neighborhood uptown near The Circus. The Lower Assembly rooms sat in the older city center lower down, hence the distinction between upper and lower rooms. The lower rooms were used during the day for promenading and visiting and at night for dancing. Beautiful stone walks and terraces surrounded the building, which encouraged people to gather to see and be seen, and dawdle away a few pleasant hours. 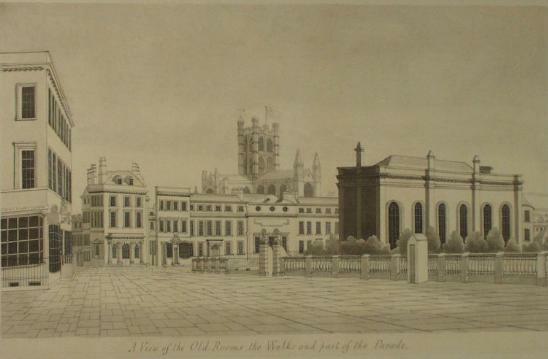 Lower Assembly Rooms (right) at Terrace Walk (With Bath Abbey in the distance), Benjamin Morris, late 18th century. 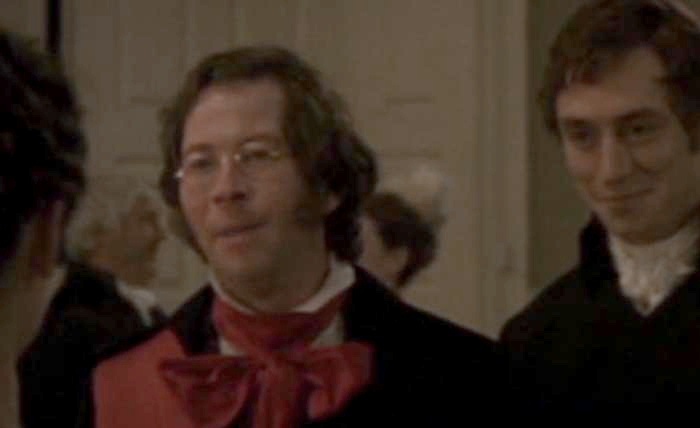 As with my previous posts about Bath in conjuntion with Austenprose’s celebration of Northanger Abbey, I shall feature a series of quotes from original sources that will help to illuminate what Bath, its people, and the Lower Rooms were like during the latter part of the 18th century. 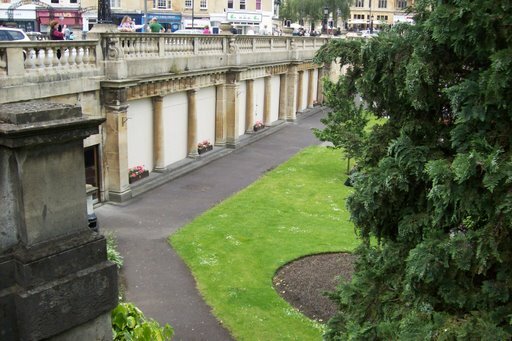 The above image from the Victoria Art Gallery in Bath shows the beautiful Terrace Walk made of bath stone around the lower rooms and the shops that faced the walk. 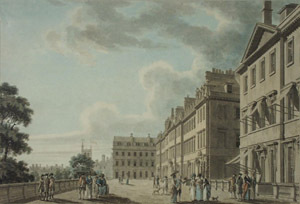 Wiltshire’s Assembly Rooms, the building on the left with the three arched windows, did not survive competition with the Upper Assembly and was demolished. The ball-room was used during the daytime as a promenade, for which it was well suited from its size and pleasant situation; its windows commanding extensive views of the Avon winding amidst green meadows and flanked by wooded hills. The accompanying reproduction of an old print taken from a design for a fan, shows the ball-room when used for this purpose. It was the fashion also for the company to invite each other to partake of breakfast at the Lower Rooms after taking their early baths or first glass of water. In the above map detail, you can see the position of the lower rooms in relation to the upper rooms. As the new century progressed, the middle classes, invalids, and people seeking to retire began to replace the aristocrats who had lent such glitter to the social whirl. Sir Walter Elliot, if you recall, chose to remove his household to Bath where he could still lord it over others as a man of consequence. As an impoverished and lesser peer in London, he would have led a life of relative obscurity, which his enormous ego could not abide. The social changes in Bath, along with new anti-gambling laws and the death of Beau Nash, led to the city’s decline in social caché. The proprietors of the new assembly rooms then declared that their rooms would be open every evening except Fridays and alternate Sundays. They also announced that a ball would be held every Monday and a concert every Thursday. The small old-fashioned lower rooms simply could not compete. When they burned to the ground in 1820 they were not replaced, and today only a remnant of their former glory remains. 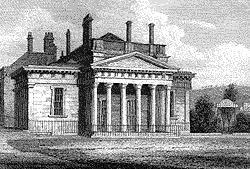 The Old Assembly Rooms, the scene of Beau Nash’s glory, erected in the half of the last century, were destroyed by fire in 1820, excepting the portico and exterior walls, which now form a part of the Literary Institution. 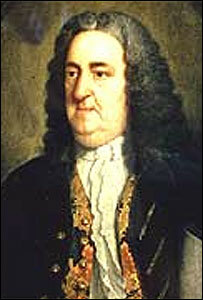 Nash was master of the nearly 50 years from 1710 to 1760. Handbook for Travellers in Wiltshire, Dorsetshire, and Somersetshire, By Edmund Venables, John Murray (Firm), W E Flaherty, 1869. Update: Ellen Moody’s excellent post on Northanger Abbey, which I highly recommend, sits here. For a history buff like myself, and a writer who takes great pains to weave authenticity into her stories, this is FANTASTIC stuff! Keep up the good work! Thank you for your kind words, Joanna. 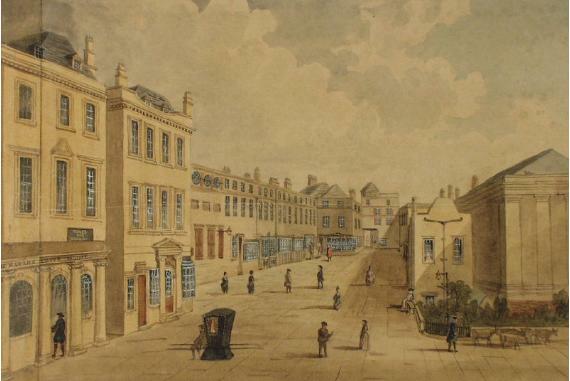 It’s been fascinating to research Bath’s historic buildings and find quotes from the past. Thank You for all your hard work I visited Bath March 5th 2010. I actually stood above the Old Assembly Room and didn’t know! What a shame it was destroyed. Was Captain Thomas Wade a relation to George do you know ??? I found the article very interesting as my grandfather x4 who was born in Bath in 1774 apx was the Master of Ceremonies in the Lower Assembly Rooms from 1812-1816. He went bankrupt and I even found a wanted poster and a portrait of him on the internet – his name Francis John Guyenette. He dies in 1844. Francis John Guyenette was my Great, great, great grandfather. His son Edwin, was the father of my great grandmother Lillian. Thank you for this bit of information, it is a helpful addition to my genealogy. Of course, I am always looking for additional cousins who can help add information and verify that which is found.